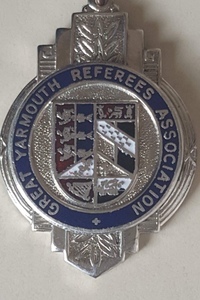 The Gt Yarmouth Referees Association is one of the oldest Referee Associations in the country and meets on the fourth Monday of the months from September to April. We currently meet at the Gt Yarmouth Town FC Clubhouse on Sandown Road and offer a warm welcome to any new members or members on holiday in the area. Our meetings start at 7.00pm and usually end by 9.00pm. The Branch has a high youth content of referees within the branch all taking an active part. Our meetings are active with the usual weekend’s topics and we are often joined by a guest to share either training or a topical issue. The branch also welcomes people thinking of a career in refereeing to come along and join in. The branch also has Mentors, Referee Coaches and observers as members in the branch.